One of the biggest trends that emerged last year was anything and everything rendered in beautiful, luxe satin—especially in the realm of footwear. From slides to boots to sneakers, just about every shoe imaginable has been reimagined in the smooth, shiny fabric—and we simply cannot get enough. The second you ground a look with silky, satiny shoes, it instantly becomes ultra-chic. Now, if you don't yet own a pair of these luxe shoes, you're in luck, because we found the most amazing satin sandals currently on the market, and even if you do possess a pair or two, you'll certainly want to grow your collection with one of the below styles. The best part about the satin sandals we picked out? Even though they're on the dressier side, you can wear them with anything from a pretty satin skirt and tee to a pair of jeans with a cool linen shirt. Plus they make day-to-night dressing a breeze. So the next time you feel like your ensemble is missing that special something, slip into a pair of satin sandals and you'll be set. Read on to shop the styles we can't get enough of. Available in size 5 to 12. Available in size FR39 and FR41. Available in size IT39 and IT40. Available in size IT36 and IT39. Available in size 7 to 9.5. Available in size 5 and 8. Available in size 6 to 9. Available in size IT35.5 and IT40.5. Available in size IT35 and IT39.5. Available in size IT36 and IT41. Available in size 37 and 39. Available in size 6.5 to 9.5. Available in size 6.5 to 12. Available in size 6.5 to 11. 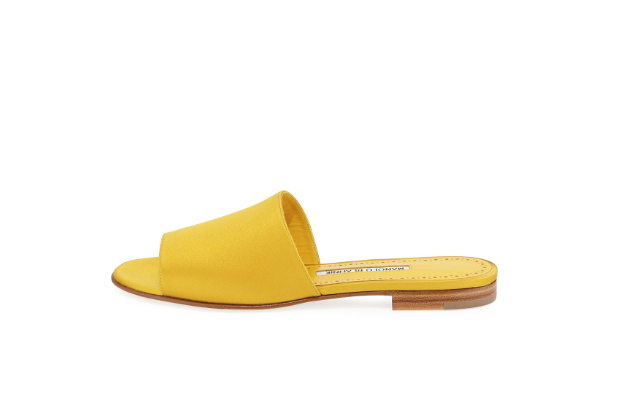 Next up, shop the best summer sandals to wear when you plan on walking—a lot.